SimPly Fit provides individual and small group training in a beautiful and private studio. Specializing in TRX, Bosu, Rip Trainer and Yoga, we use cutting edge concepts and equipment to teach compound movements to work your core and entire body. With more than 20 years experience in the fitness industry, Kim designs individual and small group programs that are tailored to your specific goals. Kim’s theory is to make fitness fun and functional, using “all core all the time” through compound movements to make each session efficient and effective. As a health coach, Kim also has a holistic view to health and wellness, and has a genuine desire to help people. In her spare time Kim enjoys walking her dogs, roller blading, going to the beach, and spending time with friends and family. 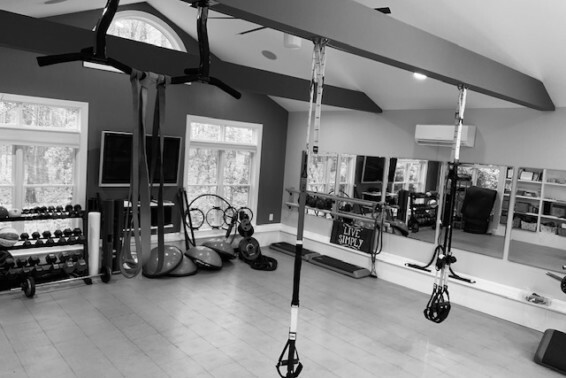 SimPly Fit is a private studio located in the heart of North Raleigh near the intersection of Strickland and Creedmoor Roads. The studio is outfitted for complete workouts using the TRX Suspension System, and providing you with the best in strength & flexibility training as well as yoga instruction. Training and small group classes are by appointment only. We provide cutting edge personal training for individuals and small groups in a private studio environment – no big gym membership needed. As an Integrative Nutrition Health Coach, Kim will provide the guidance and accountability needed to make fitness and lifestyle changes to dramatically improve your quality of life. Check out our 6 month program. Individual and small group yoga instruction in a private studio setting. Perfect for mother/daughter, couples, or a group of friends. All group packages are for 2 to 4 people & must be used with at least two of the group members present to train, or can be doubled for a solo session. Program Overview: Meet with your coach twice per month to develop & implement an individualized wellness program with a holistic approach. * Discounts for payment in full – all coaching appointments will be set at the beginning of the program. SimPly Fit is is a private studio located in the heart of North Raleigh near the intersection of Strickland and Creedmoor Roads. Training and small group classes are by appointment only.